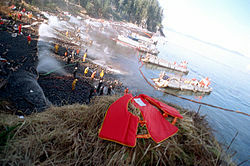 Mechanical cleanup was started shortly afterwards using booms and skimmers, but the skimmers were not readily available during the first 24 hours following the spill, and thick oil and kelp tended to clog the equipment. Despite civilian insistence for a complete clean, only 10% of total oil was actually completely cleaned. Exxon was widely criticized for its slow response to cleaning up the disaster and John Devens, the mayor of Valdez, has said his community felt betrayed by Exxon's inadequate response to the crisis. More than 11,000 Alaska residents, along with some Exxon employees, worked throughout the region to try to restore the environment. The Exxon Valdez supertanker was towed to San Diego, arriving on July 10. Repairs began on July 30. Approximately 1,600 short tons (1,500 t) of steel were removed and replaced. In June 1990 the tanker, renamed S/R Mediterranean, left harbor after $30 million of repairs. It was still sailing as of January 2010, registered in Panama. The vessel was then owned by a Hong Kong company, who operated it under the name Oriental Nicety. In August 2012, it was beached at Alang, India and dismantled. The economy of the city of Cordova, Alaska was adversely affected after the spill damaged stocks of salmon and herring in the area. The village of Chenega was transformed into an emergency base and media outlet.The local villagers had to cope with a tripling of their population from 80 to 250. When asked how they felt about the situation, a village councillor noted that they were too shocked and busy to be depressed; others emphasized the human costs of leaving children unattended while their parents worked to clean up. Many Native Americans were worried that too much time was spent on the fishery and not enough on the land that supports subsidence hunting. ^ a b c d Skinner, Samuel K; Reilly, William K. (May 1989). The Exxon Valdez Oil Spill: A Report to the President (PDF). National Response Team. Retrieved October 31, 2015. ^ "EVOS: The Spill: Timeline". November 2, 2013. Archived from the original on November 2, 2013. ^ "Properties of Prudhoe Bay (2004) (ESTS #679)" (PDF). Environment and Climate Change Canada. Government of Canada. 2004. Retrieved March 19, 2019. ^ a b c "Questions and Answers about the Spill". History of the Spill. Exxon Valdez Oil Spill Trustee Council. Retrieved May 26, 2009. ^ "Frequently Asked Questions About the Spill". Exxon Valdez Oil Spill Trustee Council. Archived from the original on June 30, 2007. Retrieved October 11, 2010. ^ a b Hazardous Materials Response and Assessment Division (September 1992). "Oil Spill Case Histories 1967–1991, Report No. HMRAD 92-11" (PDF). Seattle: National Oceanic and Atmospheric Administration: 80. Retrieved March 10, 2008. ^ Brandon Keim (March 24, 2009). "The Exxon Valdez Spill Is All Around Us". Wired Science. Retrieved June 29, 2010. ^ Shigenaka, Gary (2014). "Twenty-Five Years After the Exxon Valdez Oil Spill: NOAA's Scientific Support, Monitoring, and Research" (PDF). Office of Response and Restoration. Seattle: National Oceanic and Atmospheric Administration. Retrieved January 17, 2017. ^ a b Graham, Sarah (December 19, 2003). "Environmental Effects of Exxon Valdez Spill Still Being Felt". Scientific American. Archived from the original on March 29, 2006. Retrieved March 9, 2008. ^ "Exxon Valdez disaster – 15 years of lies". Greenpeace News. Greenpeace. March 24, 2004. Archived from the original on February 15, 2008. Retrieved March 10, 2008. ^ "16 Years After Exxon Valdez Tragedy, Arctic Refuge, America's Coasts Still at Risk" (Press release). Sierra Club. March 23, 2005. Archived from the original on March 5, 2008. Retrieved March 10, 2008. 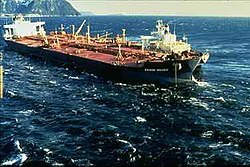 ^ "Exxon Valdez Photos". NOAA. p. 7. Archived from the original on July 14, 2005. Beginning 3 days after the vessel grounded, a storm pushed large quantities of fresh oil onto the rocky shores of many of the beaches in the Knight Island chain. ^ a b Practices that relate to the Exxon Valdez (PDF). Washington, DC: National Transportation and Safety Board. September 18, 1990. pp. 1–6. Archived from the original (PDF) on June 11, 2010. ^ a b "Ten years after but who was to blame?". Greg Palast. March 21, 1999. Retrieved July 21, 2010. ^ a b Meyer, Bill (March 5, 2009). "Captain of Exxon Valdez offers 'heartfelt apology' for '89 oil spill in Alaska's Prince William Sound". The Plain Dealer. Cleveland, OH. Retrieved January 17, 2017. ^ Palast, Greg (June 25, 2008). "Court Rewards Exxon for Valdez Oil Spill – Greg Palast". ^ Leveson, Nancy G. (July 2005). "Software System Safety" (PDF). Massachusetts Institute of Technology. pp. 18–20. Archived from the original (PDF) on November 8, 2010. Retrieved July 30, 2010. ^ Spyrou, Andrew G. (January 27, 2017). From T-2 to Supertanker: Development of the Oil Tanker, 1940 – 2000, Revised. iUniverse. ISBN 9781462002344. ^ Oil Spill Case Histories (PDF). Report No. HMRAD 92-11. NOAA. September 1992. Archived from the original (PDF) on July 8, 2010. Retrieved July 21, 2010. ^ "The Exxon Valdez Oil Spill: Final Report, State of Alaska Response" (pdf). Exxon Valdez Oil Spill Trustee Council. Anchorage, AK: Alaska Department of Enviironmental Conservation. June 1993. pp. 61–87. Retrieved March 19, 2019. ^ Council, Exxon Valdez Oil Spill Trustee. "Oil Spill Facts – Exxon Valdez Oil Spill Trustee Council". ^ Kirby, David (April 22, 2013). "Corexit: An Oil Spill Solution Worse Than the Problem?". www.TakePart.com. Participant Media. Retrieved April 19, 2016. ^ Baker, Mallen. "Companies in Crisis – What not to do when it all goes wrong". Corporate Social Responsibility News. Archived from the original on February 22, 2008. Retrieved March 9, 2008. ^ SC Jewett; TA Dean; M Hoberg (2001). "Scuba Techniques Used to Assess the Effects of the Exxon Valdez Oil Spill". In SC Jewett (ed.). Cold Water Diving for Science. Proceedings of the American Academy of Underwater Sciences, 21st Annual Scientific Diving Symposium. Retrieved June 27, 2008. ^ "Exxon Valdez: Ten years on". BBC News. March 18, 1999. Retrieved May 24, 2010. ^ Short, Jeffrey W.; et al. (2004). "Estimate of Oil Persisting on the Beaches of Prince William Sound 12 Years after the Exxon Valdez Oil Spill". Environmental Science & Technology. 38 (1): 19–22. doi: 10.1021/es0348694. Retrieved March 19, 2019. ^ Short, Jeffrey W.; et al. (January 19, 2007). "Slightly Weathered Exxon Valdez Oil Persists in Gulf of Alaska Beach Sediments after 16 Years" (PDF). Environmental Science & Technology. American Chemical Society. 41 (4): 1245–1250. ISSN 0013-936X. Retrieved March 19, 2019. ^ a b Peterson, Charles H.; Rice, Stanley D.; Short, Jeffrey W.; et al. (December 19, 2003). "Long-Term Ecosystem Response to the Exxon Valdez Oil Spill". Science. 302: 2082–2086. doi: 10.1126/science.1084282. Retrieved March 19, 2019. ^ "Exxon Valdez oil spill still a threat: study". Australian Broadcasting Corporation. May 17, 2006. Retrieved March 9, 2008. ^ "25 years later, scientists still spot traces of oil from Exxon Valdez spill". ^ a b "Exxon Valdez – 25 years after the Alaska oil spill, the court battle continues". ^ Lanchester, John (January 7, 2009). "Books: Outsmarted". The New Yorker. Retrieved July 21, 2010. ^ "490 F.3d 1066". law.resource.org. Retrieved May 28, 2016. ^ Staff writer (October 29, 2007). 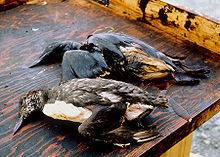 "Supreme Court to review Exxon Valdez award". CNN. Retrieved March 10, 2008. ^ Staff writer (February 27, 2008). "High Court may lower Exxon Valdez damages". CNN. Associated Press. Archived from the original on March 3, 2008. Retrieved March 10, 2008. ^ Savage, David G. (June 26, 2008). "Justices slash Exxon Valdez verdict". articles.latimes.com. Tribune Company. Retrieved June 26, 2008. ^ a b Exxon v. Baker , 554 U.S. ( Supreme Court of the United States of America June 25, 2008). ^ Smith, Sharon. "Exxon's Legal Guardians". CounterPunch. Retrieved March 21, 2013. ^ "Reaction of Sen. Leahy on Supreme Court Ruling in Exxon v. Baker". Leahy.senate.gov. June 25, 2008. Archived from the original on January 31, 2009. Retrieved February 25, 2009. ^ Egelko, Bob (January 28, 2006). "Punitive damages appealed in Valdez spill". San Francisco Chronicle. Retrieved March 10, 2008. ^ Bandurka, Andrew; Sloane, Simon (March 10, 2005). "Exxon Valdez – D. G. Syndicate 745 vs. Brandywine Reinsurance Company (UK) – Summary of the Court of Appeal Judgment". Holman Fenwick & Willan. Archived from the original on March 4, 2008. Retrieved March 10, 2008. ^ "Exxon Corporation 1993 Form 10-K". EDGAR. U.S. Securities and Exchange Commission. March 11, 1994. Archived from the original on March 4, 2008. Retrieved March 10, 2008. ^ Erb, George (November 3, 2000). "Exxon Valdez case still twisting through courts". Puget Sound Business Journal. Retrieved March 10, 2008. ^ Exxon v. Baker, CV-89-00095-HRH (9th Cir. 2006). ^ "Exxon Sues Alaska, Charging Cleanup Delay". New York Times. October 25, 1989. Retrieved October 15, 2016. ^ "Exxon, Blaming Coast Guard, Says U.S. Is Liable in Alaska Spill". New York Times. October 2, 1990. Retrieved October 15, 2016. ^ Travis, J. (March 28, 2008). "Science and Commerce: Science by the Masses". Science. 319 (5871): 1750–1752. doi: 10.1126/science.319.5871.1750. ^ "Oil Pollution Act of 1990 – Summary". 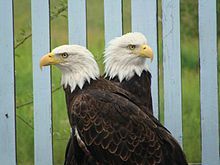 Federal Wildlife and Related Laws Handbook. August 18, 1990. Retrieved March 10, 2008. ^ Carrigan, Alison. "The bill of attainder clause: a new weapon to challenge the Oil Pollution Act of 1990". Boston College Environmental Affairs Law Review (Fall 2000). Archived from the original on April 29, 2005. Retrieved March 10, 2008. ^ a b "Exxon Valdez Is Barred From Alaska Sound". The New York Times. November 2, 2002. Retrieved March 10, 2008. ^ Kizzia, Tom (May 13, 1999). "Double-hull tankers face slow going". Anchorage Daily News. Archived from the original on February 3, 2008. Retrieved March 10, 2008. ^ Fargo Balliett, James (2014). Oceans: Environmental Issues, Global Perspectives. Routledge. p. 51. ISBN 9781317463665. ^ Loshbaugh, Doug (2000). "School of Hard Knocks". Juneau Empire. Archived from the original on September 27, 2007. Retrieved May 18, 2010. ^ 1994, Victor Goldberg, The Journal of Legal Studies, Recovery for Economic Loss Following the Exxon ‘Valdez’ Oil Spill"
^ Carson, Richard; Hanemann, W. Michael (December 18, 1992). "A Preliminary Economic Analysis of Recreational Fishing Losses Related to the Exxon Valdez Oil Spill" (PDF). Exxon Valdez Oil Spill Trustee Council. Retrieved March 10, 2008. ^ "An Assessment of the Impact of the Exxon Valdez Oil Spill on the Alaska Tourism Industry" (PDF). Exxon Valdez Oil Spill Trustee Council. August 1990. Retrieved March 10, 2008. ^ "Economic Impacts of Spilled Oil". Publications. Exxon Valdez Oil Spill Trustee Council. Archived from the original on June 30, 2007. Retrieved March 10, 2008. ^ "25 Years After Spill, Alaska Town Struggles Back From 'Dead Zone'". NPR.org. Retrieved January 21, 2017. ^ "Native Alaskans Still Reeling 25 Years After Exxon-Valdez Oil Spill". www.wbur.org. Retrieved January 21, 2017. ^ Daley, Patrick; O'Neill, Dan (December 1, 1991). ""Sad Is Too Mild a Word": Press Coverage of the Exxon Valdez Oil Spill". Journal of Communication. 41 (4): 42–57. doi: 10.1111/j.1460-2466.1991.tb02330.x. ISSN 0021-9916. ^ "Critics call Valdez cleanup a warning for Gulf workers". CNN. Retrieved December 10, 2015. ^ D. Michael Fry (November 19, 1992). "How Exxon's "Video for Students" Deals in Distortions". The Textbook Letter. Retrieved July 21, 2010. ^ Thomas, Pierre; Weiser, Benjamin (April 13, 1996). "Reputed 'Manifesto' Recovered". The Washington Post. p. A01. Retrieved January 28, 2011. ^ Hiaasen, Rob (August 12, 1995). "Remaking history with Gump sequel". The Baltimore Sun. Retrieved March 31, 2018. ^ Gordon, David (April 4, 2019). "EXCLUSIVE: Hear George Salazar Sing "Iron Mike" From Jonathan Larson Project Album". Theater Mania. Retrieved April 6, 2019. Lee, Douglas B. (August 1989). "Tragedy in Alaska Waters". National Geographic. Vol. 176 no. 2. pp. 260–263. ISSN 0027-9358. OCLC 643483454. BP Played Central Role in Botched Containment of 1989 Exxon Valdez Disaster – video report by Democracy Now! People of the State of New York v. Exxon Mobil Corp.